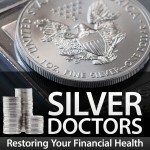 Silver Doctor: Professionals Still Buying Precious Metals - Wall St. for Main St.Wall St. for Main St.
Jason Burack of Wall St for Main St had on returning guest ‘Doc’ from the popular precious metals news website Silver Doctors http://www.silverdoctors.com/ and owner of SD Bullion. During this 35+ minute interview, Jason asks Doc about the sentiment for gold and silver in the West since he deals with customers who buy physical gold and silver. Doc thinks sentiment levels are worse in the US and the Western world than in 2008. He thinks Wall St, investment banks, governments and central banks have tried to intentionally manipulate sentiment, but that many professional investors are still accumulating physical precious metals every month or on dips. Jason and Doc discuss Ted Butler’s theory on JP Morgan owning over 40 million oz of physical precious metals, whether silver miners are in trouble financially, if pure deflation will be allowed for how long and how well gold performs during deflation.